You don’t need to be Gumby to practice yoga! Who practices yoga? People of all shapes and sizes. 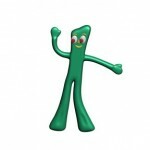 There are more people in yoga class with tight shoulders and hamstrings than there are super flexible Gumby’s! A yoga class can help you reconnect with the suppleness you used to have while living in the body you have now. YogaGeauga is a cozy yoga studio located in the center of Geauga County- right on the border of Burton and Newbury. We offer different styles and levels of yoga class to accommodate most practitioners. We also offer Yoga Tune Up® classes and Roll Model Method® Therapy Ball self care classes and workshops on a periodic basis. If you are looking for the Roll Model teacher training, next up is Sept. 21-22 here in Newbury or Oct. 12 and 13 in Greenville, NC. Yoga is not just about stretching your muscles – it’s about strength, flexibility, balance and agility in body and mind. It has been shown to reduce cardiovascular risk factors, improve balance, counteract the deterioration of spinal discs, reduce inflammation and reduce the physical and mental effects of stress. Yoga practitioners experience a greater ability to focus and deal with life’s ups and downs. One of our students recently summed it up saying “On days I’ve practiced yoga I just feel better”. If you have some yoga experience but are new to the studio you can also try Beyond Basics on Mondays at 6:30pm, Thursdays at 7pm or Slow Flow on Fridays at 9 and Sunday at 3:30. And if you know your way around a Sun Salutation and take Downward Dog with ease, drop in on a Vinyasa class. Anyone can check out Truly Gentle Yoga for Relaxation on Tuesdays or our monthly Restorative Yoga class on the third Tuesday of the month. Because we are a small studio, we ask that you let us know you are coming to class to insure there is space. You can call, send an email, or click on the class on the calendar and follow the booking instructions. Don’t worry if you forget, drop-ins are welcome! Continue to read through the website for class descriptions to find which class is right for you and helpful hints for what to wear and what to bring. If you have any questions, give us a call or send us an email. And if you’d like to receive periodic updates and links to interesting yoga info, join our mailing list using the form below.